I’ve said it before. I’m out. Done with Facebook, and other social media. I’ve done it at least twice. Once in 2014 and again in 2016. I threatened to way back in 2011. This time I’m doing it though—really. What prompted this? Well, it was a number of things really. Facebook other social media has been getting a ton of bad press recently. A quick Google search will put you a click away from a number of articles and studies linking social media use to increased rates of depression, decreased productivity, and having it all on our mobiles seems to make it even worse. I can’t recall where I heard this, but if you work in an office setting take a look at how your coworkers work. You’ll see that the millennials and younger gens have their hands on the keyboard, with their phones on their desk, in front of the keyboard, in between their arms. Trust me. It’s true. Additionally, I’ve been writing a lot for our company blog about all of the privacy issues around Facebook and the sloppy, if not indifferent, and perhaps even malevolent manner in which they handle personal data from browsing history to passwords, and it started to feel like maybe Facebook isn’t the kind of neighborhood I want to hang out it. Mary Louise Kelly: Which has meant the fragile poppies are being crushed. People are lying down in the fields to get that perfect photo for social media. So Mayor Manos has issued a warning. Mayor Setve Manos: Keep your dogs on leashes. Don’t pick the poppies. Don’t trample the poppies. Don’t wade into the poppies. Don’t roll around on the poppies. Don’t slide down the poppies. Have we really fallen this far, that we are destroying flowers and risking rattlesnake bites for likes on Instagram and Facebook? Is this really what is driving our decision making? If so, it’s like we are heading towards (d)evolving to the script of a bad tv show episode. With this, I started thinking about how I use social and why I was using it. And, the conclusion I came to was, it was often about the likes. And that, that didn’t feel good. Add to it, that Zuck was looking to merge it all together, and I was less inclined to stay. I had already deleted Facebook from my phone. I removed Instagram that morning. March 19, 2019. The fourth time is a charm. In truth, I had been growing tired of Facebook. Its feed was less relevant and was filled with nonsense from the “What’s happening in Townsend, MA” crap. The one thing that kept me coming back were the memories. I loved the little moments that I had forgotten about, mostly photos of the kids when they were younger. I didn’t want to lose those. Then I discovered that you can download all of your data from Facebook. That solved the problem there. The Instagram piece was relatively easy to quit, although I do feel as though the world is missing out on my remarkable wit and photos of my chickens. I kept Facebook messenger. I kept WhatsApp. I still have Snapchat (although I barely know how to use it). I have Twitter, but haven’t paid much attention to it since @tsand stopped following me. Twitter kind of feels like a cesspool for me anyway. In short, if you know me, you know how to get ahold of me. I wish that I had kept better track of my screen time on my phone so I could compare a before and after. I know I’m on it less though. I don’t miss the drama of Facebook. of all, it’s Insta I miss the most, but again, I don’t miss the feeling of wanting to post something so it will get a ton of likes. I wasn’t a big selfie guy to begin with, but I almost certainly don’t have to worry about dying while trying to select the best filter for that selfie I just took in a rattlesnake infested field of poppies. I am totally annoyed with the town sports programs for my kids that, despite having my email address, prefer to make announcements over Facebook. I didn’t like your page when I was on Facebook and I’m not going to now. There’s also the, “Hey did you hear about…Oh wait, no you’re not on Facebook” conversations. Not a big deal, really, and thus far each one has made me thankful that I was unaware of the drama unfolding in someone else’s third cousin’s friend’s life. But so far it’s not that bad. One conclusion that keeps coming into mind is that these social media tools aren’t free. While the currency may not be USD, I still do pay for Facebook, Instagram, etc. I pay for it with my data. My shopping history, my likes, interests, political views, hobbies, family members, friends, etc. I have simply decided that my data was worth more than the service I was getting. Who knows how long it will last? I the previous attempts to leave weren’t all that permanent, although, in my defense, I don’t think I entered them with the intention of those breaks being such. I’m 100 percent sure I’m committed to it this time either, but I am more interested in trying than I was in the past. It is an option that is, at least, on the table. I feel like I had the parenting rug pulled out from me last night. “Oh, you play at school?” I asked. “No, he can join my world. There’s like this chat thing,” he replied. Now, Roblox, is a game that my kids have recently gotten into. I don’t know much about it, but it seems to be a sort of Minecraft-ish thing. My kids have been playing Minecraft in their self-contained worlds for a while now and I have no problem. I consider myself a pretty tech-savvy guy, but this one had slipped under my radar. Apparently, this game has an online component where they can connect and chat. To be honest, I really don’t know much about it, save for that it isn’t the self-contained little world I had assumed it to be. Maybe because I am so familiar with tech and its effects on the developing brain and emotions that this has me worried. We talked more about it, and while he tried to assuage me of my concerns and convince me that there was nothing I had to worry about. I shared with him that all we hear as parents are about the bad things like bullying and meanness that happen in sites like this. Here’s where I am conflicted. This came up through an innocent conversation. In the middle of a really great and positive conversation about the boy meeting a new friend in his new school. It was a conversation in which we were talking about our feelings, being open, and sharing. If I shut down this game (which is what my gut tells me I have to do as a responsible parent), what does that do to future conversations? How do you explain to a 9-year-old why? I don’t like this feeling. It feels like someone gave my kid permission to go outside, without supervision, and play with a bunch of people I don’t know without my consent. I genuinely don’t know what to do here. Luckily I’m not alone in having to make this decision, and M and I will work through this together, but this is the first time as a parent, that I feel we are at a crossroads–where there are two paths to choose, and each has its own peaks, valleys, and pot-holes. And my kid is running about 20 yards ahead of me. I wrote this back in 2016, and having no place to put it, left it in draft form. Two years later, I can see no reason not to hit publish. On a hot and sticky July night in baseball’s oldest, and perhaps most revered ballpark, the Grateful Dead took the stage. I know. It wasn’t the Grateful Dead. There was no Phil, and, of course, there was no Pigpen, no Jerry. On a hot and sticky July night in baseball’s oldest, and perhaps most revered ballparks, three former members of the Grateful Dead plus, “the Donna”, a guy who played for the Allman Brothers (well, not the real Allman brothers, but the band that called themselves the Allman Brothers in the late 90’s and early 2000’s) a keyboardist who’s been playing in Grateful Dead spin-offs and the guy who brought this steaming pile to the American songbook took the stage on a hot and steamy night in America’s greatest ballpark on a Friday night in July. Confession time. I am a huge deadhead. Yet my introduction to this music experience sub-culture came late. I first discovered the Dead in 2007 at the age of 28. I had just purchased a VW Passat that had a combination CD/tape deck in it. I happened to pop in one of my sister-in-law’s bootleg tapes of a dead show from the late 70’s and was hooked from then on. Fenway is a wonderful place to watch a show, but you lose out on some of the tail-gating spectacle that you see at other venues. I use the word lose there, because I’m sure there are some that are looking for that. I’m not one of them. The show was an early start, the sun was still setting, and it was covering most of the outfield at that point. If this was a ballgame, the outfielders would no doubt have trouble fielding a high fly-ball. The heat, was real, and so was the opening jam. It was sticky, nectary sweet. From the teasing and foreshadowing of “Morning Dew” (turning out to be the penultimate song of the second set) at the :32 mark into a “Jack Straw” that Bobby sang with all of the heart and vigor of a man half his age. The percussionists beat the tools of their trade in a mostly in-sync fashion through the night despite the heat. Newbies, Oteil and Chemeti played brilliantly. Any question of whether or not Mayer is the right guy for this gig have long past. His Bluesy background (omitting is terrible originals) served him well that now. No, he doesn’t have the bluegrass background of Jerry, but there is magic there. He has mastered Jerry’s tendency to park himself on a section of the neck of the guitar, milk it for all it’s worth, and move on to the next section. Wash, rinse, repeat. And he can do the weird. I recently took a two month hiatus from Facebook. Now to many, this probably wouldn’t seem like a big deal. For me though, a great deal of my career has been spent using social media professionally to market schools and colleges. In many ways, Facebook was where is started. It was at least one of the first three. I was sick of it. I was sick of seeing the ads everywhere. I got really sick of the click-bait headlines from George Takei and others. I was sick of the drama and the feels and all of the junk. I felt like I was just spending a ton of time rotting my brain on useless junk. So I cut the cord. I almost did it once on my phone. It’s a scary thing to do though. I pulled back after the first attempt. I wasn’t sure if I deactivated my account if I would lose everything, and I had a lot of stuff there. I was definite an early adapter and as near I can tell, I was onboard with Facebook as soon as it opened to the non-Harvard population. Second time, this one on my MacBook, I did it. Pulled the trigger and deactivated my account. It was neither as scary or permanent as it sounded. But I still stayed connected. It’s true. This wasn’t a social media blackout. I still stayed on social media, I just quit Facebook. I checked my LinkedIn. I checked Twitter (oddly enough I used to be a HEAVY user of Twitter, but have found it significantly less interesting of late). My primary social media toy was Instagram. I used that and checked it pretty frequently. I liked the visual. I like the simplicity. I like the lack of advertisements and click-bait and especially liked the lack of drama. I didn’t miss it… I really didn’t miss Facebook at all. The only reason I went back to it is because I felt like I had to for work. That’s it. Except when I missed stuff. A good friend of mine’s dad passed away. I would have totally missed that news and the funeral had my wife still not been on Facebook. People tend to reserve announcements life altering announcements for Facebook and there was a sense that I was missing out on the big news and changes of people in my life that I don’t see everyday. A multi-channel approach is essential. Facebook users are becoming less active and checking their Facebook accounts less frequently. It used to be that if you wanted something to be seen, you published it on Facebook. I don’t believe that the case anymore. You need to make sure that you are hitting all of your channels. Get a website! So many small businesses neglect or don’t even have websites, instead relying on Facebook to fill there need. This got really old after a while. More than once in my two months away, a mom and pop shop lost the sale because they didn’t have a website. It feels good to not be so connected. It does. It really does. I highly recommend it. Words I said…Goodbye, my friend. My name is Drew Millikin, and I am Jim and Martha’s fifth son. I used to be their fourth, but then Meg got married and Mike bumped me down to the 5th spot. Jim arrived my sophomore year at Saint Michael’s. I swam for him for three years and was one of his captains for two. After graduating, I coached for his team, Green Mountain Aquatics before joining Jim on the Saint Michael’s pool deck, coaching a team we both love deeply from 2006 through his penultimate season. It goes without saying that I have been thinking of Jim a lot these last two weeks and reflecting on the special relationship we shared. I have always resisted saying that Jim was a second father to me. I’ve hesitated for two primary reasons, one, Jim and Martha have four wonderful kids; they didn’t need another. And two, I have a wonderful father and I never wanted to take anything away from him. As much as I may have resisted saying, Jim was like a second father to me. And as news of Jim’s illness and eventual passing began to spread, I saw that phrase everywhere, and it came from people whom I had no idea even knew Jim. What was it about Jim that led so many to look at him in this way? What was so special about this big, stubborn, bear of a man who could never be told that he was wrong? A man who was always ready for a hug, or a congratulatory handshake/high five grasp after a race. A man who did not burn bridges; he nuked them. Why were so many of us impacted so deeply by this man? Out of curiosity, how many of us are teachers? Coaches? Educators? Please keep your hands up, if in some way, large or small, Jim Donoghue had an effect on your decision to enter that vocation. What was it about that man? I can’t speak for everyone who ever swam for Jim, but I can share with you my theory: It is that Jim saw all of us through a lens, which we could not. He saw us in our true potential—our full selves. And he demanded that we live up to and carry ourselves with the self-respect and dignity we deserved. I certainly experienced this as a student athlete at Saint Michael’s, and I witnessed this coaching with him in those years we coached our beloved team together. One of those moments was what I consider one of the greatest teaching moments I have yet to witness. We were coaching a certain team on a certain training trip in Florida on a certain New Year’s Day. It was quite evident that watching warm-ups that a number of them had been celebrating the night before. It was actually clear that from the stench in the vans on the ride to the pool that they had been celebration the night before and perhaps into that morning. Jim asked me to stop warm-up, which I did, puffing my chest, awaiting a red-faced, full on, chewing out. Instead, Jim spoke calmly and coolly. He did not raise his voice. He did not admonish. He did not shame, although I suspect that many of them felt ashamed. Jim instead talked about self-defeat. He shared his belief that every practice is an opportunity to improve, as is every set, as is every stroke. They owed it to themselves to take advantage of each of those opportunities and that through their poor decision-making, they had deprived themselves of that opportunity and disrespected themselves in the process. Jim easily could have torn them down. After we started them on the pre-set, I told him that his reaction was the exact opposite of what I was expecting. His reply was that all that would have done was make him feel better while making them feel worse than they already did. He would not allow those swimmers to deprive themselves of the opportunity to achieve their best. And there were many times when his idea of our best, seemed so out of reach that they seemed ridiculous. I remember that swimming for him. I didn’t understand until I began working with him, coaching with him, that he truly believed in us. And he would try like hell to convince us of the potential that he saw. For Jim understood that the opponent was not the team on the other side of the pool. It was not the swimmer in the lane next to us. Our biggest opponent was that black line on the bottom of the pool—that voice inside our own heads. Our own self-doubt. I reached out to a number of Jim’s former swimmers asking for anecdotes and memories in preparation for this knowing that there is no way I can speak for all of them. The response was overwhelming and beautiful. And most of the stories, spoke of the same common theme demonstrated on the pool deck that New Year’s day. It is that, above all else, Jim valued and taught self-respect, dignity and kindness. I said that I don’t want to speak for his swimmers, and I won’t. I will however, speak for him, and all of the messages of love and support I received and witnessed confirm what I am about to say. Jim Donoghue loved you all. It didn’t matter if you swam for him for one year or your entire lifetime. He loved every one of you. Actually, I am going to speak for all of us who swam for Jim. We will miss you, coach. *Updated 2/1/16 to include some ad-libs. Last week I posted about my collections of various notebooks while I was on a crazy trip to Houston, Texas for a school fair. Part of the inspiration for that post were the four notebooks I brought along with my in my carry-on. I’m not really sure why I brought all of them. I could have easily left two of them behind, but I brought them none-the-less. This is from a conference presentation about tour guides given by the admissions team at Maderia. Good advice. These were from a webinar for new directors of admission given by Ben Douglas of St. James School and Andrew Weller of Ridley College. I don’t have a direct quote here, just some of my handwritten notes I took while reading Jim Collins’ Good to Great. I feel like the power of that book might be diminished a bit after the recession and the fact that a bunch of the companies he references in the books were total criminals, but it still does have value. I particularly like his use of a bus as an analogy to staffing. He describes the importance of getting the wrong people off of the bus, the right people on the bus, and the right people in the right seats on the bus. Once you do that, then your organization can reach its potential. I’ve become rather notorious for my notebooks. I have one with me constantly, and I take notes in every meeting in which I am a part. There’s something satisfying about putting pen to paper rather than just plucking away a keyboard. For me, there is something in the motion that helps me to remember. 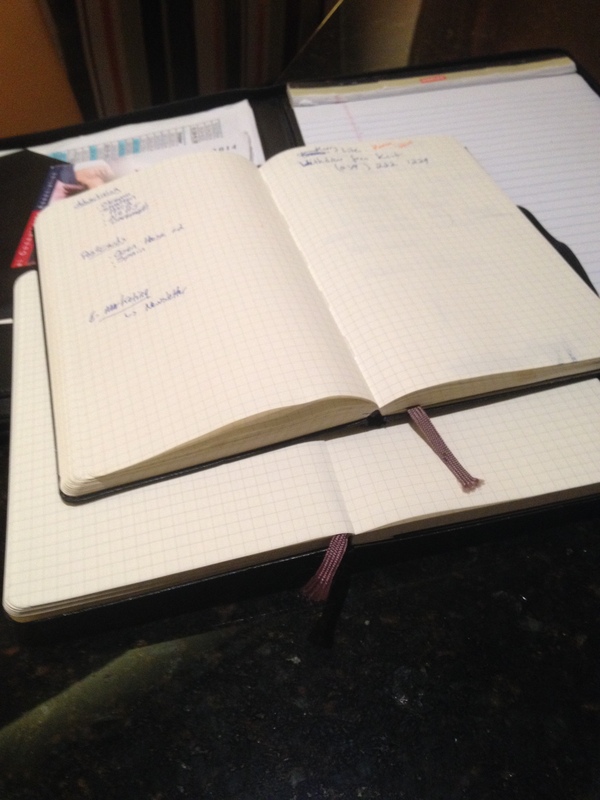 Regardless, I figured I’d share my current notebook methodology here. Black, medium-sized and squared. This is my primary note taking notebook. It goes with me to every meeting, conference, or any other opportunity where I need to take general notes. I go through about one or two of these a year. I like and the portability of it. I prefer squares to lines because of my doodling habit. It also helps if I ever need to map something out. The pocket in the rear is perfect for storing receipts from travel. I never throw them out and will often go back and review my notes, especially from conferences.